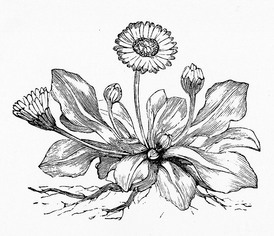 Pretty black and white drawing of a dandelion plant. With roots showing and a prominent central flower, this flower image would make a great addition to your creative projects and crafts. This image is copyright free, can be used as we found it or easily colorized. It was included in the 1882 publication Golden Rays which was engraved by Samuel E. Brown (d ca 1860) and published by Hall and Whiting of Boston. This dandelion plant drawing could easily be made your own with a little color. A little yellow, some green and it would be oh so pretty. The main flower is so nicely drawn that it could easily be edited and used alone.